Your cat makes a show of being regal and in control, but you could turn all that around with this Inflatable Unicorn Horn Cat Hat! 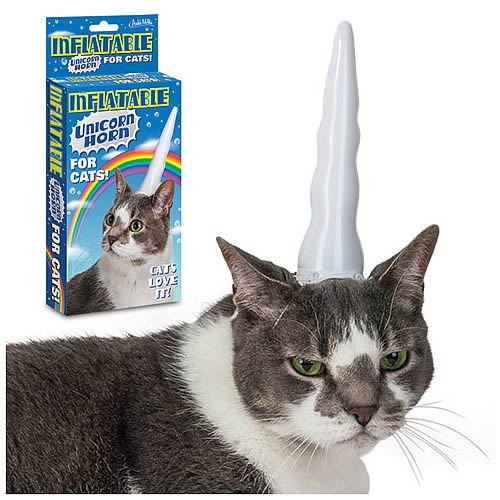 A vinyl, 5 1/2-inch long unicorn horn, this Inflatable Unicorn Horn designed specifically with your discerning cat in mind features a 4-point elastic strap system that holds it comfortably on a kitty's noggin. Why have just a regular cat, when you could have a uni-cat with the Inflatable Unicorn Horn Cat Hat? Ages 14 and up.